You came around a lot quicker than I expected, but I have to admit that it's really nice to see you already. You definitely have the potential to be both good and not so good, but we're all crossing our fingers for a lot of the former and not so much of the latter. We'll see, but no matter what I'm ready for whatever you have to throw at me. I'm going to try to get to sleep before 1am and get up a little earlier. Even though I'm the most productive between 12am and 3am, I always manage to squeeze more into the day if I've woken up early. There's usually less thinking about the things I should be doing and more of the actual doing. Although each morning will probably begin with the writing of an extensive to-do list over a bowl-like mug of coffee because it's the only way I can get things done these days. The thrill of checking things off a list when I've finished them excites me way more than it should, but whatever gets things done is fine with me. I took a bit of a step back from a lot of things at the end of last month. I can't remember the last time I checked twitter and I must admit, it's been quite nice but I am sorry if you've tweeted me and I haven't replied. I know it would only have taken a few minutes to have a little look, but I just needed some time away. It's also been over a week since I checked my inbox, which seemed like a great idea at the time but I'm sure when I see how many unread emails are in there in a couple of hours I'll wish I'd kept an eye on it. It'll be nice to plug back in and get back in the swing of things, but I think I'll try to schedule in a few more laptop-free evenings. Have a little more me time, a few more evening chats with my mama over our new favourite dessert apple pie and escape into a good book more often. There are so many books I'd really like to read this year and seemingly so little time to do it. I wish I could be a professional book reviewer. Is that a real job? If it is, I want to be one of those when I grow up, please! Speaking of book reviews, my new blog will be live this month and book posts will make up a huge part of it. It's a little scary starting something brand new. For a few weeks I was trying to make it instantly perfect but I know that I'll be making little tweaks here and there for the rest of forever probably! I'm excited to start a new journey over there and I'm hopeful that with time, I'll be as proud of it as I am of this little space. I don't think they'll be too dissimilar though, and I'm keeping my fingers crossed that it will be a really interactive space. You make sailboat extra special. Don't ever forget that. It's nice to be feeling busy. Pausing sometimes to recharge and refocus is always a good thing, but I'm ready to start moving forwards again. Oh...and if we could arrange some more sunshine filled days, that would be wonderful! Yes March can be pretty unpredictable you never know what this month is going to throw at you haha :) I'm excited for your book reviews! Have a lovely weekend! Sometimes you just need to take some time out and unplug - not checking Twitter or emails can give you the space and freedom you need to escape the manic pace of everyday life, even if just temporarily. I really should sleep earlier as well, it's not uncommon for me to go to bed at 1:30 or 2am on weekdays. Not great! please make sure you let me know when your new blog is live, im excited for it!! Very much looking forward to the new blog Jennie! I would love to be a professional book reviewer, maybe one day. It is always good to take time out of your day to disconnect from technology and get back down to earth. 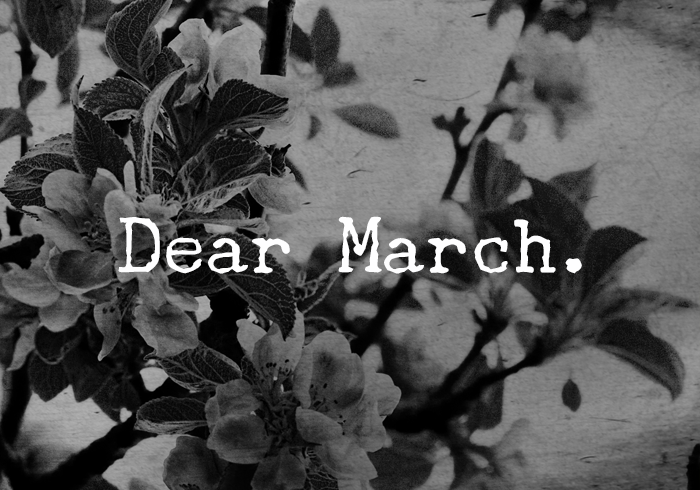 I hope you have a wonderful March! That are some great resolutions, i think laptop-free evenings can definitely help! Times away are so nice - I've been known to vanish for another country for 1-4 months whenever I've felt the need to completely disconnect, and they've always done such a perfect job. Until I come back and discover thousands of emails - most of them pointless! Sometimes we all need to take a step back - I've been doing it myself lately. I hope you've felt better for it! I do love a good checklist - I write one every morning when I arrive at work, nothing is more satisfactory than a massive tick to say it's done. So satisfying.